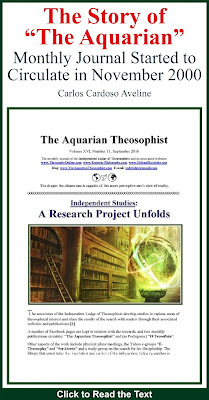 The June 2013 edition of “The Aquarian Theosophist” is available. 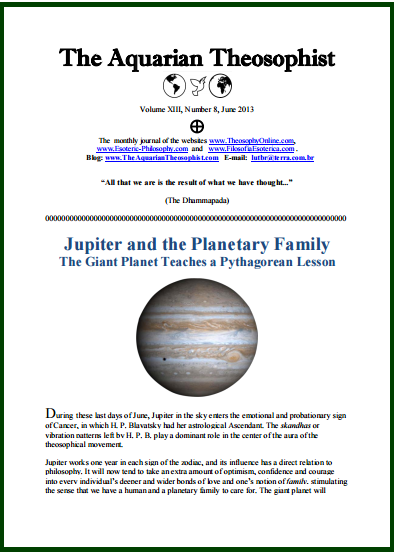 The opening article is “Jupiter and the Planetary Family: The Giant Planet Teaches a Pythagorean Lesson”. Jupiter is now entering a new sign, as part of its permanent work around the terrestrial Zodiac. Each new ULT Day commemorates the work and the life of Robert Crosbie, the founder of the ULT. In order to mark the ULT Day on June 25th, we are publishing an article by Steven H. Levy entitled “The Mission and Future of The United Lodge of Theosophists” (pp. 2-5). The note “Robert Crosbie” contains biographical data on this pioneer and a unique fragment on the daily life of truth-seekers. “Mahatma Gandhi’s View of Food” is the article written by Mr. B. P. Wadia. 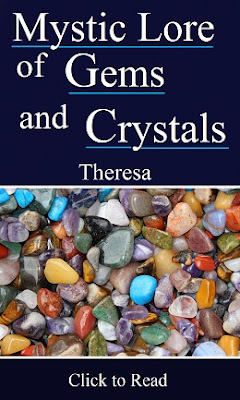 Its subtitle gives us the main idea: “To Eat With Discernment Helps Inner Purification”. On p. 8, we can see a note by Joaquim Soares: “The Importance of Free Debate”. Its subtitle underlines a fact of fundamental importance: “criticism is the great benefactor of thought in general”. The article “Vieira, a Pioneer of Theosophy” examines the life and the work of António Vieira, “the 17th century friend of Jews, Indians, and Black People”. There is a second article by Steven H. Levy, entitled “The Power of the Small: One’s Trust in the Law is Developed Through Attention”. The edition includes a number of short, illustrated notes on various topics, and the analysis of “A Little-Known Photo of HPB: An Outer Image Expressing Inner Feelings”. The story of “The Aquarian” is shown on p. 18. 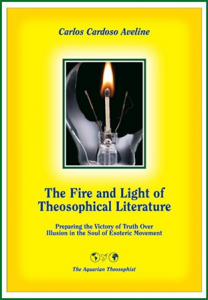 The edition closes with the List of New Titles in www.TheosophyOnline.com and associated websites.